A crafty prize fighter with an impressive amount of skill and stamina, he was the former World Welterweight Champion (1955 to 1957) and World Middleweight Champion (1957 to 1958). The son of an Italian immigrant onion farmer, he began his professional boxing career in the Lightweight Division during 1948 following service with the United States Marine Corps. His first chance at a world championship was in 1953, when he lost a 15-round unanimous decision to the champ Kid Gavilan for the Welterweight title. The result was in spite of Basilio’s 2nd-round knockdown of Gavilan in which the champion rose to his feet at the count of nine. He earned a second title shot on November 30th, 1955, this time it would be a contest against Tom DeMarco. Basilio emerged (whom knocked DeMarco down twice in the 12th-round) with a 12th-round technical knockout giving him the Welterweight crown. 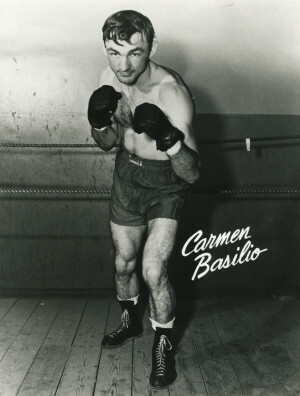 The bout was named “1955 Fight of the Year” by Ring Magazine, and this would be the first of five years in a row Basilio was included in that honor (1955 to 1959). He briefly relinquished his belt of Johnny Saxton in March of 1956 and reclaimed it with a 9th-round technical knockout in their rematch six months later. After moving up to the Middleweight Division, back-to back bouts against the legendary Sugar Ray Robinson for the Middleweight Championship solidified Basilio’s place in boxing history. The first encounter resulted in a 15-round split decision win for Basilio in September 1957, followed by another 15-round split decision this time in favor of Robinson six months later (1958). Two technical knockout defeats to Gene Fullmer (1959 and 1960), followed with his final title bout in 1961, which was a 15-round unanimous decision loss to Paul Pender for the Middleweight crown. This would be the final fight in Basilio’s career. He compiled a 56 win (27 knockout) 16 loss and 7 drawn record and was enshrined into the International Boxing Hall of Fame in 1990. Additionally, he is a member of the World Boxing Hall of Fame and the National Italian-American Sports Hall of Fame. After retiring from boxing, he became a physical education instructor in the Syracuse-area. He never entirely strayed away from the sport, as he was an occasional manager of local fighters.